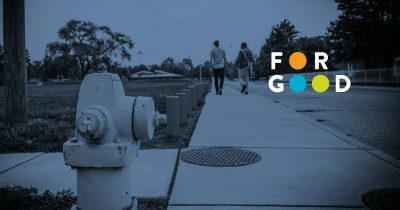 In this month’s episode of For Good, we learn from IUPUI’s Mays Institute for Diverse Philanthropy about the history of black philanthropy and members of the African American Legacy Fund of Indianapolis on the efforts underway to leave a legacy of giving in our community. Transcript of episode available below. You’re listening to, For Good. Central Indiana Community Foundation’s podcast highlighting stories about passion, purpose and progress in Central Indiana. At CICF we believe in creating a community where everyone can reach their full potential—no matter their place, race or identity. This is our community and these are your stories. TAMARA: Hello and welcome to For Good. I’m Tamara Winfrey-Harris, the vice president for community leadership and effective philanthropy at Central Indiana Community Foundation. I am excited to announce that we are recording today from the Center for Black Literature and Culture at the Central Library in Downtown Indianapolis. It’s an inspiring setting to discuss the impact of black philanthropy and what it has done to affect our community over generations. I’m here first with Dr. Una Osili and Dr. Tyronne Freeman from the Mays Family Institute on Diverse Philanthropy at IUPUI’s Lilly School of Philanthropy. I’m very honored to sit on the board of advisors for the Mays Institute. Thank you both for joining me today. You both have very illustrious paths, and no one can probably talk about it better than you can. Can you introduce yourselves? We’ll start with you, Tyronne. TYRONNE: Well I am a professor at the Lilly Family School of Philanthropy, and I hail from New Jersey but I’ve been in Indianapolis since the mid 1990s. This is home now. I’ve raised my family here and this is where I’ve had my full engagement with the non-profit sector and with the study of philanthropy. TYRONNE: And an author, yes, a forthcoming book under contract with the University of Illinois Press on Madam CJ Walker and black women’s philanthropy at the turn of the 20th century. I’m very excited about that. TAMARA: Can’t wait to read that. What about you Una? UNA: Yes, thank you. I was born in New York City and grew up in Nigeria in west Africa, so have had a very global experience in terms of understanding people of African descent and their interest in philanthropy. I have lived in Indianapolis for about 20 years, which is a long time. This is home. My husband and I have strong roots in the city. We also have two children who have grown up here. It’s been a wonderful community to learn about philanthropy because we see it around us every single day. TAMARA: Una also is a very valuable member of the CICF board. You two are both philanthropic experts. As I was preparing for this conversation, it occurred to me that when you think about philanthropists, when people think about philanthropists, I think a very narrow picture emerges. It is usually straight, white, very wealthy man, but I bet you would tell me that philanthropists, the look of philanthropists is a lot broader than that. Why do we have such a narrow view of philanthropy, Una? UNA: Well I think one of the reasons we have a narrow view is that we have not necessarily told our stories well. Embedded in cultures around the world, and especially in communities of color, we have rich traditions of philanthropy. One of the things that I certainly try to emphasize is that philanthropy is multifaceted. It includes gifts of money, but also gifts of time and talent. At the Lilly Family School, we have two large scale national projects that are intentionally collecting information about communities of color, African American, Latino, Asian American, LGBTQ communities, so that we can start to change the narrative and so that people of all different race, ethnic backgrounds can realize that they are philanthropists, that they can claim that title. Another way that we’re trying to change the narrative is we have this large scale project called Generosity for Life, which allows you to see how people of all backgrounds contribute to philanthropy. I think in that, we’ve also used the word generosity because sometimes the word philanthropy seems not accessible to communities of color. TAMARA: We have this narrow story that the Mays Institute is trying to change. What does black philanthropy look like? I suppose its history and what does it look like today? TYRONNE: There’s not an era in American history in which African Americans weren’t philanthropic. That’s something that’s very important, because definitions are very important because what you look for determines what you’ll find. If we start with this very high level, high flown, elite definition of philanthropy and a narrow slice of who’s doing it, then that’s where we’re going to look. When we look and follow that trail, you may see people like Carnegie and Rockefeller who are giving money to black communities, but you focus on that fact. You don’t think about what the communities are doing for themselves before and after that, or how they’re taking those resources and regenerating them and using them to pursue their own agenda. I think that’s part of the challenge, but African American philanthropy is very diverse. It has always involved money. It has always involved time. It has always involved words. I’m the son, grandson, nephew, and cousin of Baptist preachers and first ladies and Sunday school teachers. The black church is the fundamental philanthropic institution in the community and always has been. When you think about what happens in church, you think about the idea of the pastor giving a word, and you think about words as gifts. You think about … My grandfather started preaching in 1940s, so that’s Jim Crow America. Black folks certainly needed a good word there because Jim Crow America was telling them so many negative things about what it meant to be black. Whether it’s the way we speak to each other, depositing or speaking life into each other, volunteering, serving, being an usher, being in the choir, being a part of other more traditional organizations, Girl Scouts, Boy Scouts, sororities, fraternities, there’s just so many vehicles for giving in the community that have been there from the beginning. TAMARA: It sounds like what you’re saying, for people listening, if they grew up, for instance, seeing their parents give to the building fund at church, or if they saw their parents give through their sororities and fraternities, that’s philanthropy. TYRONNE: Absolutely. Absolutely. That is philanthropy, even if the word is not used, because that’s the other thing. In the church, you won’t see the word used really. You’re just doing the Lord’s work or doing what you’re supposed to do, but even in the fraternal communities and the other service organizations, black club women have this rich history of giving and pooling resources and advocating and being on the front lines, but don’t be confused. There also have been wealthy African Americans who have deployed more financial resources along the way too, and that goes back generations. It’s not new with Oprah and LeBron and folks now. There were black millionaires 100 years ago, 150 years ago. We see those types of giving happening at all levels across the community, across time. TAMARA: Effective philanthropy officers very often do this wise giving workshop with new donors. One of the questions that I always love to hear them ask, and I love to hear the answer is, what is your personal giving story? What are the instances that you’ve grown up in your life witnessing, giving, or giving yourself? I wonder, do you have a personal giving story, Una? UNA: I have two giving stories. The first is really my parents. My parents both were philanthropists. They’re big givers, but in very different ways. My father is very much an informal giver. He single-handedly sent all his nieces and nephews to college and financed them and even his own siblings. He believed in … I think both parents believed so strongly in education that even when they were in graduate school they were supporting members of their own family, supporting their educational pursuit. That was a very powerful example for me. Then I think my mother had much more of an engagement story. As very young children she took us as volunteers to help different communities, but children who did not have mothers, in Nigeria as well as senior citizens who didn’t have anyone to take care of them. During holidays she made it a point that we would go and visit those communities and we brought gifts with us, but we also brought our talents. We danced and performed traditional African dances and we would rehearse ahead of time. We brought a whole group of kids, our friends, with us. I think both of them emphasized that you bring your talent to making a difference. It’s not just about the money, although the money is important, but you also bring your voice. You bring your talents. You bring your time. TAMARA: What about you Tyronne, what’s your personal giving story? TYRONNE: Mine too is based in family and church. My father donated blood a lot when I was a child and so I would go to the clinic with him and didn’t quite understand what it all meant, but I remember very vividly going there with him and later understanding why he was doing that. My mother would look after some of the elderly members in our congregation, taking them places and doing things for them, so very much growing up with this expectation that this is what you do. Find your own way to plug into it, but this is what you do. This is who we are and this is how we live. My earliest memory of when my sister and I demonstrated that after having been around it is, we went to a conference with our family. In between sessions going out, doing some touristy stuff, we passed a gentleman on the street who was homeless and didn’t have anything. I just remember seeing him sitting there. Then a day or two later when we’re leaving, we’re cleaning up our hotel room and we have all of this leftover food that we didn’t quite finish, but then my sister and I said, “Well, why don’t we take it to that man?” My parents went and said, Yeah, sure, let’s go do that.” We walked down there and we gave it to that man. He was still there again a day or two later. Then my parents also gave him some money. That was a chance for us to demonstrate that. I think I was probably about eight or nine or something like that. That was my first memory of being engaged with that. TAMARA: Like both of you, I grew up watching my parents give their work, wealth and wisdom. They gave to the church. They were both very active in their fraternities and sororities and community groups like and spending time. Both my parents are educators. Occasionally my dad would see a former student that was down on their luck and give them money or give them a ride. When we were little he got us all lifetime memberships at NAACP because he thought it was important to both support that organization, but also teach us something about the struggle for civil rights. For a long time I thought that kind of giving started with our generation, but it didn’t because as I became interested in genealogy and my family’s history, I found that my great-great grandfather back in the late 1800s gave land for the, at the time, colored school to be moved on to that land so that the students in Poplar Creek, Mississippi could have somewhere to be educated. The culture of giving began in my family long before the present day, which is something we’re very proud of. TYRONNE: What you just shared about your family’s background is an example of the story that’s not been told, because there’s a lot of attention on again, how Rockefeller and Carnegie funded schools and how Rosenwald created schools, but by black communities created their own schools during this era. That wasn’t an anomaly, but again, we tend to focus on what the elites were doing to these communities, but we don’t stop to look and take the time to look at what the communities were doing for themselves. TAMARA: How can the community, and also not-for-profits, grow by acknowledging the impact of black philanthropy? So often I hear people saying, “We don’t have any African American donors,” or, “We don’t know where they are.” How can this community harness the strength of black philanthropy? TYRONNE: If you’re with an organization that doesn’t have a history of engaging communities of color, I think you have to ask yourself some questions about why that is. Do people perceive and understand the nature of the relationship of your organization to the community and what you might be doing there? Do they perceive your organization as hospitable to the community, or has your organization actually contributed harm to the community? How diverse is your organization and how is it serving the community, and then how are you reaching out? I think the default is for us to stay within our own spheres of influence. We tend to live with and work with people who are just like us and that has implications throughout the rest of the organization. I would also ask hard questions just about the ways in which you’re building your cases for support, the ways in which you are extending yourself to those communities and understanding the way that you’re serving diverse populations, and then also the kinds of messages that you are sending to reflect that case. How are you speaking to their lived needs and lived experiences with your mission? TAMARA: I think what I took away from that is, shocker, the way you engage African American donors is just like you engage any other donor, and that is to build a relationship. However, not-for-profits and organizations have to be cognizant of the ways that people’s identities impact their experiences. TAMARA: The way you go about building those relationships, the harm that has to be mitigated, all of those things may be different. TYRONNE: Absolutely. Absolutely. You may come from it from your perspective and say, “Well maybe race doesn’t matter to me or is not important for my identity,” but we’re not talking about you. We’re talking about the population you’re seeking to serve and reach out. Understand them as individuals and get to know their preferences and their dreams and their desires, but also recognize they’re connected to these broader and cultural traditions, and may be practicing them or expressing them in different ways. Respect them as individuals, but recognize them as being a part of this broader context. TAMARA: Wonderful. Thank you so much for joining us today. Now I’d like to welcome Kiahna Davis and Rodrick Wheeler. They are steering committee and founding members of the African American Legacy Fund of Indianapolis. They’re going to talk about black philanthropy in action, but first, can each of you briefly tell me a little bit about yourself? KIAHNA: I’m Kiahna Davis and I am not native to Indianapolis. I am transplant from what we call the region northwest Indiana. Hopefully the folks in Gary would claim me. I’m from Michigan City, but I spent a lot of time in Gary. Then I went to IU, graduated, moved to Chicago and I did this thing called falling in love. My husband, I followed him and then I made him follow me to Indianapolis and that was almost 16 years ago. We have found this region to be just a good place for us. I’m glad that we settled here. I have been in finance and accounting for over 20 years actually, but more than that because I try not to put myself in a bubble. I call myself a philanthropist, a community organizer and activist. Anywhere and any place that can use my skill set, I try to offer it up to whomever wants it. I think a lot of people don’t even know what I do professionally because they see me in the community just because I just love just helping the community basically. TAMARA: I think this is awesome because you just illustrated what Tyronne and Una were just talking about, the fact that black philanthropy takes so many forms in the community that we often don’t acknowledge. I love what you said about being a servant leader in the community and giving in a lot of different ways. What about you, Roderick? RODERICK: I am Rodrick Wheeler. I’m a native of Indianapolis, born and raised here. I have a unique story. My unique story is I grew up as a foster youth and I aged out of the child welfare system. I experienced poverty straight on. My profession, I’ve been blessed to be able to be in philanthropy for probably about 15 years. Then prior to that, I was in the service. I’ve been either a public servant or served our local community. Being both sides is interesting. We see the impact of service delivery in trying to address poverty, but in Indianapolis, I think Kiahna and I and the rest of the steering committee, we feel that we need more of community building and more voices of African American descent and experiences that can really understand how we can address poverty from looking at our assets, looking at our resources. TAMARA: I’m going to ask you for the details and logistics for this fund in a minute, but we’ve been spending a lot of time talking about the values that underpin our philanthropy. I want to know where this idea came from. I know you guys go way back. TAMARA: Which one of you are going to lay claim to the idea? How did this happen? RODERICK: I’ll take that one real quick and then I’ll turn it over to Kiahna. A good friend of ours, Wynisha Schafer, called me one … I want to say it was a Sunday evening. I was in my car. I coached football and I had just finished. I think I just got off the road from a tournament. Wynisha called and she said, “Hey, I got this idea to start this fund.” I said, wow, that’s a great idea. It might be the right time. I’ll get back with you. Hung up. First person I called was Kiahna Davis. I said … Click, immediately. I said, Kiahna, I need some help to start this fund, because I’ve known Kiahna for probably 25 years. RODERICK: If you know anything about helping the community or starting things, you go and get the right talent to make it happen. That’s why I knew I had to call Kiahna. She immediately said, “Yes, let’s do it.” Kiahna, please share your version. KIAHNA: No. I think that’s how it culminated. I think there had been some buzz and chatter in the city just with various organizations and people that I know. I guess, Roderick, you said it best. I didn’t know this about myself, but I am a starter. I start things. KIAHNA: I came to Indianapolis and I started a chapter here. I was chartered to what now is called the Exchange at the Urban League. I never considered myself that, but I get excited about those things. We were talking and then when Roderick called me, I thought, this is the universe coming together. When the universe comes together in that fashion, you can’t help but to move. We just started. Honestly, we just started with conversation and what we wanted out of this. The beauty of this is you had three really community-minded people that were selfless. That made it work because in this space we didn’t want ego. We didn’t want personality, because we knew that we had to have the community’s trust. Although I think technically people will call us founders or charter members or whatever you want to call us, I think we just say we were people who just … It worked. The universe brought us together at the right time for the right opportunity. RODERICK: I had been working with CICF. I worked for CICF for over 10 years, and left as director of community impact. We immediately thought that we should house this in a philanthropic institution that can support us. That worked out. Then Kiahna, she brought a number of talented individuals who took it to the next level from the three to what we see, at least at the beginnings now, and I think it’s going to grow and be more, but there’s been so many talented people to join us with the same spirit of selfless service. TAMARA: What exactly is the African American Legacy Fund of Indianapolis? KIAHNA: The concept was we can do more together. I’m in a space where one of my personal mission statements is unity is our only hope. KIAHNA: I do believe that we all come from a rich history that says we might have little, but when we pull it together, it’s a powerful force. I akin it to growing up … I grew up in the African Methodist Episcopal church. I remember my great grandmother and her siblings building a church. They didn’t have much. They worked second jobs. They did what they could do to build what they thought would be a beacon for the community, a refuge for the community. I think that in all of us, we have those stories where we saw our ancestors really do something with little. The concept of the African American Legacy Fund of Indianapolis is really that we want to first pull our resources together. I think also it’s a fund that is led by African Americans. I know that sounds weird with African American in the name, but we wanted to make sure that this was a fund that was initially funded by African American philanthropy. That, for me, is very important because I believe if others are going to invest in our community, we should lead in that investment. We brought those two concepts together to form what we call the Legacy because our hopes, and I believe all the groups’ hopes, is that we leave something in a hundred years from now just to be proud and say we took our dollars together. That’s why one of our themes within our circle is that every dollar has dignity. We want all voices at the table because even in the black community, we’re not monolithic. I think we think we all think alike and we act alike, and we don’t. Some of us are more privileged than others. We wanted this fund to represent all the spectrums of the African American experience. TAMARA: You can correct me if I have this wrong, but what you’re asking for first is you are looking for founding members who will contribute $2,000. TAMARA: $1,000 will go to a giving circle, which will allow for immediate philanthropy. TAMARA: Then the other $1,000 will go towards beginning an endowment that you hope will eventually reach $10 million. TAMARA: That then every year that can be granted out to the African American community for decades and centuries to come. Am I correct? KIAHNA: That is correct. $2,000 gets you … We want that to be the founding member contribution. We’re hoping through the giving circle, that we can take folks through really their hopes and dreams and visions on philanthropy in an educational piece. What do we want to accomplish with this money? What are your value systems? We’re hoping through the giving circle we can formulate some educational pieces and then at the end of that be able to award monies to whomever the group decides to award it to. Then like you said, this legacy part is the donor advise fund. Our goal is, I think Roderick and I laugh about it, and he always corrects me, is when we reached $10 million, when, not if, when we reach $10 million. RODERICK: I know we’re going to do it. The legacy … This fund is a good time for us to bring the community together and see if we can add another tool in the toolkit to serve our community. Service delivery non-profit organizations, their missions may be obsolete as time goes on. People and their giving and their wealth are transmitted from one generation to the next, because we are all going to leave this Earth sooner or later. The issues change over time. I think by launching a legacy fund that has an endowment, that is to support the community into perpetuity, that it could grow and change with the time to complement all of the things that are going on now in the community in terms of service delivery, but service delivery does not necessarily focus on community building. I believe that this effort and these tools are in line with that spirit of honoring those who have the resources, who are affected by the challenges, but it’s also have the ability to build community alongside of investing in the community. KIAHNA: Roderick, as you were talking about that, I thought about that idea of dignity and hope and those words and how big and powerful those words are to our community. We’re hoping that through this initiative, this is one piece of sticking your chest out in our community. I’m sure there’s many more people out there doing a lot of wonderful things in the African American community. We just hope that this one thing galvanizes from a funding perspective, that there are resources now to incubate ideas and strategies and grass-root initiatives, whatever they are, and some sense of pride in this. KIAHNA: Yes, it is. I’m getting goosebumps as you were talking, just the explanation of that. I have a six year old daughter who I really try to teach this level of Mommy can do it, but if you do it and if you invest in yourself, you will learn something for a lifetime. That’s really what I liken this to, that … Not to say we will not be in partnership and collaboration with others, and that eradicating some of the issues that we face in our community won’t take that, but I also believe that there’s pride in leading. I’m just humbled to be a part of the vision. KIAHNA: You want to go to CICF.org/AALFI. You can go there, then you can read about us. You can see who all the steering committee members are. Then at the end, at the bottom of that, you can contribute. If you’re not ready to contribute and you want more information, there is an email address there. You can just send us an email and someone will get back in touch with you. RODERICK: Kiahna, she made … I want you to talk about this Kiahna, is this idea of families can join. Just talk a little bit about that. KIAHNA: I think when we were talking about it, we were very intentional to say we didn’t want organizations to be founding members. We said this had to be individual. Then we looked at it and we said, “Man, that the African American community is not … We don’t operate in an individual capacity. It’s usually a unit.” We said, “You know what? If the Davis’s decided to come together, we could pay $2,000 as a unit, as a family, to come together as that founding member and send a representative from our family.” We want to honor the black family in that way, to allow a family unit to come to the table and be a founding member and have a representative represent the family at the table. TAMARA: Speaking of families, last question, and that is … When I was speaking with Una and Tyronne earlier, we were sharing our giving stories, because so many of us growing up, either watching parents or watching other people or maybe just through the circumstances of our lives, have seen examples of giving of time, talent and treasure in the black community. Do either of you have a giving story that you would like to share before we sign off? RODERICK: How we approach that is … I was probably a recipient of a lot of community gifts. Going to school … I was young. I wore the same clothes two weeks in a row. That brought a lot of attention to me, especially the wrong type of attention. You can only imagine. The community would band together and send clothes home to me and things of that nature. When I aged out of foster care and went to IU, and that’s where me and Kiahna met each other, I really just wanted to figure out how we can help people. I didn’t have a profession in mind. I didn’t know much about professions, but eventually I made my way through to philanthropy. Since then, me personally been still with the spirit of philanthropy where it’s not necessarily tracked through the IRS tax code, but it’s the extension of your resources to people in your community that you care about. KIAHNA: I think for me, I never defined it as my giving story, but I think I have a passion for the pooling of resources. Maybe it comes from my faith background. I don’t know what that is, but it’s deep in me. I have a visual of … My grandmother had 13 kids. My mom was fourth in line. My sister and I are some of the oldest grandkids. My mom was married young. My dad was off in the military. We all came back to my grandmother’s house, everyone. I remember in one room there were two queen beds in one room. My mom, me and my sister slept in one bed and my aunt and her kids slept in another bed. That was normal. We didn’t think anything was abnormal about that because we were with our family. I thought about how my grandmother provided. She gave to us to make sure that whatever’s happening in our lives, whatever, military had my dad off, that we were taken care of. I think for me that has totally informed the way I think about my responsibility, is that I think about how generations before me have done so much more with less. TAMARA: Well I don’t think there’s anything more to say but that. Thank you both for joining me today. Before we close out this episode, I want to invite Nichelle Hayes, program specialist for the Center for Black Literature and Culture to tell us a little bit about this wonderful space we’re in. We opened October of 2017. The community has really supported us and wrapped their arms around us and attended our programs. When they see me out in the street, they encourage me. Kids are getting library cards. It’s really been a phenomenal journey. TAMARA: You can come into this space, you can read books by African American authors, you can look at the beautiful art on the walls. There’s programming. Is there anything coming up that listeners should be aware of? NICHELLE: Yes. Right now we’re in the middle of our 31st Meet the Artist, which is amazing. The art will remain at Central Library in the Cray, that’s the original portion, and then in the newer portion until the end of March, so until March 30th. You can come anytime the library is open and just soak it up and be inspired. TAMARA: Thank you Nichelle, and thank you to all of our guests. Join us next month for another conversation on For Good.